With EastComfort you can book a Bucharest apartament. Our Bucharest apartaments are suitable for business and leisure.Try sorting the apartaments below by number of guests, price or our recommendations. 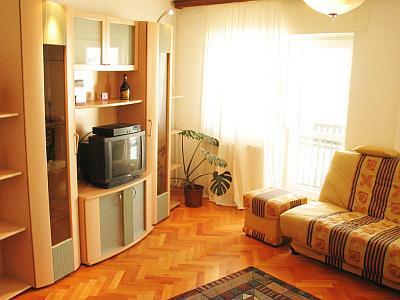 The two room Bucharest apartament is the right solution if you need to rent an apartment for short term in Bucharest. 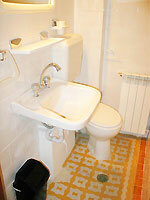 The apartament has an intercom entrance, an air-conditioned living room, cable TV and telephone. The living room is furnished with a fold-out sofa, two velvet armchairs, a table and a desk office, so as your work perfectly joins the resting hours. It comprises a red-white bedroom with a full sized bed and wardrobe and three balconies with nice view upon Bucharest. The bathroom has bathtub, shower fixture, washing machine and a bathroom cupboard with mirror which offers space for all your belongings, while the kitchen is equipped to cook and dine in. All utensils are provided.